A new range of 45-tonne Magni telehandlers are now available in Australia, headlined by the HTH 45.14. 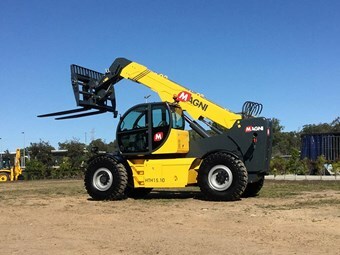 Magni Telehandlers Australia has announced the local arrival of what it says is the world’s biggest telehandler, the Magni HTH 45.14. The local distributor’s product manager Greg Sealey says the 45-tonne model is part of a new Magni HTH lineup, which offers the "broadest range of high capacity fixed boom telehandlers in the market." "There are nine models, from 10 tonne capacity and 9.7m lift height to 45 tonne capacity and 14m lift height," Sealey says. "This opens up a range of mining, resource and heavy industrial applications for operators and specialist hire and rental companies serving those markets." JCB Ecomax engines power the HTH models below 20 tonnes, while Daimler Mercedes-Benz Euro 3 engines feature in the larger models. The company’s RTH range of slewing telehandlers, ranging from four to six tonne capacities, also utilise the JCB engine. Both line-ups feature a number of attachments; such as a wheel hub handler, universal cylinder handlers, strut handlers, rear-hub handlers and a conveyor belt handler for the HTH range, and forks, winches, crane hooks, baskets, platforms, jibs, brick clamps, concrete kibbles and pipe reels for the RTH range. "Through their ability to operate with a wide range of attachments, Magni RTH and HTH telehandlers can do the work of several specialist machines like forklifts, cranes and access platforms," Sealey says. When switching between attachments, Magni says its patented safe quick-attach feature allows the telehandler’s load management system to identify the new attachment and apply the corresponding load chart automatically. Magni telehandlers are available at locations in Adelaide, Brisbane, Melbourne, Perth and Sydney. Find telescopic handlers for sale. 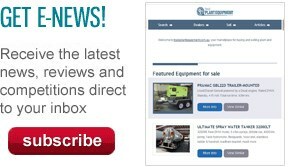 Look up telescopic handler specifications.